Some time ago, I told Marcos that when we hit a certain household salary we would stop shopping at Walmart. Well, with a recent raise, Marcos' income just pushed us above that mark, and I'm starting to wonder what it's going to take to break me of my purchasing habits, especially in the area of food. I would love to shift our grocery shopping habits to include more produce, more organic foods, fewer processed foods and higher quality ingredients in general. I can't help but feel like we often eat with a very short-term perspective: because we are young and healthy, it is easy to choose foods based on taste and convenience rather than thinking about establishing eating habits that will support our goals as parents and support our health throughout our lives. I'm not talking about going crazy and cutting out anything that isn't from a health-food store, but I would love to be more mindful about what I put in my body. But wow is it hard to change shopping and eating habits, even if your resources change. 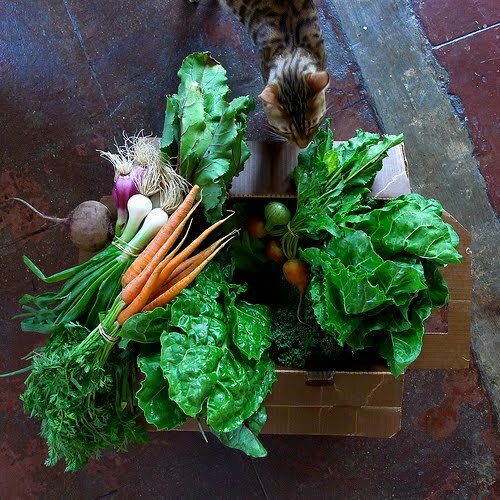 Most immediately, I would like to shop for produce at the local Farmer's Market now that the summer season is rolling in and so many fruits and veggies are ripe. I particularly want to learn which produce I should buy organic, and which ones don't matter so much. Step one is printing out this cute little cheat sheet to help me remember which are which as I'm shopping. Who could ignore weeping fruits and veggies? Another thing I want to do this summer is watch Jamie Oliver's Food Revolution on Hulu.com. Our friends got into Jamie Oliver and were inspired enough to make some real edits to their grocery shopping list. I would like to learn more about the foods I eat. And next summer, if I get on the ball, I think I would like to sign up for a CSA (Community Supported Agriculture) box, which is a weekly delivery of in-season produce from local farmers. Our friends will be out of town the next little bit and have very generously invited us to pick up and use their CSA while they are gone, and I am really excited about this trial run. So stay tuned... I may have some new recipes coming up! Don't forget to watch Food Inc. as well (on Netflix). 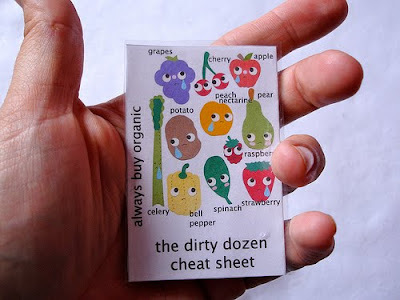 I find that I have a hard time finding most of the "dirty dozen" foods in organic. Trader Joe's does a pretty good job at it, but it is still tricky. Most you don't even have the option to buy organic at the grocery store. I want to shop at the farmer's market too. We went this morning and there were blackberries the size of your head, but alas! We had forgotten cash! (Well, actually the boys like to empty out my wallet from time to time and today was one of those times) But yeah, it's fun to buy straight from the people who grow it.